Having read Lisa Tamati’s first novel, Running Hot, I couldn’t wait to immerse myself into her follow up novel Running to Extremes. Although, it was with a little trepidation. You see, I rank Tamati’s Running Hot as one of my all time favourite running novels, alongside and equal to Christopher McDougal’s Born to Run, and Dean Karnazes’ Ultramarathon Man. And like Dean’s follow up novels to his original Best Seller I kind of expected Tamati’s follow up to be great, but to fall a little short of equalling her original masterpiece. In some ways it did. In other ways it exceeded my expectations. Like any follow up to a memoir or autobiography Tamati’s Running to Extremes lacks those initial formative chapters that applied such richness to her first novel. We know her, we know her history. So where does she begin? Well, she begins with running of course. Running through New Zealand for that matter, bottom to top, and fundraising. And that is the true strength of this novel; Tamati’s race accounts. I instantly connected with Lisa’s story, and after the first couple of chapters, which admittedly read a little awkwardly, just as her run through New Zealand did, her book ramped up a notch or two. I was riveted, hooked, and just as happened with Running Hot, I couldn’t put this book down. The piece de-resistance of this novel is Lisa’s account of running La Ultra de High. It had me on the edge of my seat, and at the end, crying out for more. Her race accounts really do convey the struggle, the challenge, and the comraderie. By the end of her novel I felt as though I’d run the Northburn 100, the Gobi desert, and the Sahara. Tamati certainly takes you along for the ride. My only complaint is I wanted more! What Tamati does give more of is tips and advice for ultra running, something I’ve found actually quite hard to come by. Perhaps because Ultra runners are too busy running to write it all down? And perhaps too, because of what becomes increasingly obvious, every ultra runner is different and takes on the challenge differently. 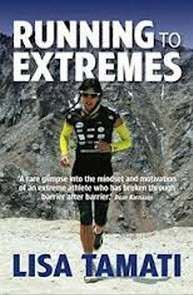 While I did find the advice in Running to Extremes interesting to read, I actually felt the book might have been improved without it and instead with more detail on Lisa’s own struggles to overcome her injuries to take on La Ultra de High (she did include a lot about acclimatising for the race – which I lapped up). I’d have loved to have seen more about the training and all the hard work that surely must go in to getting to the top of her sport. But in this, Tamati stands together with all the other ultra runner authors out there. Is it really that easy? Does it really come so naturally to these super-human beings that there’s no point writing it down? I think not! But perhaps the hard slog of reality doesn’t prove such good reading. Whatever may be the case, Running to Extremes does prove great reading, and as with Running Hot I thoroughly recommend it to any other runners out there. A must for the weekend warrior’s bookshelf.